Kara has shared her SOS pads review, and how she uses this stainless steel scrubber to clean her home. I absolutely love to use S.O.S. brand cleaning pads. I use them mostly in the kitchen for the intended use of cleaning and scrubbing pots and pans. They are also good for stuck on foods on the dishes, and also to clean the stovetop, counters and even soap scum in the bathroom. In addition, I've found the best use for it. I've had a problem with my guinea pig cages getting very dirty under the bedding. It is very stuck on and until I started using these pads nothing could get it off. I thought one day to try using one of the pads and to my surprise it worked wonderfully. I'll never be without these pads again in my home, and I'm sure I'll think of even more uses for them soon! Thanks Kara for your review of SOS pads. I've gotten several more reviews of these pads below too, since it seems like they are quite popular. Plus, people have shared even more uses with me. However, I'm always looking for more reviews and more uses in your home. Please share your pot scrubbers and scouring pads review and uses here, either for this or another brand, or read other reviews which have already been submitted. 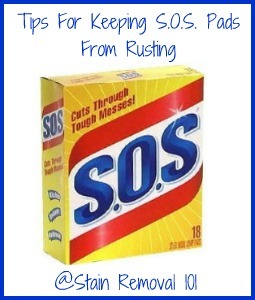 Sara shared this tip with me about how she finally figured out how to keep her SOS pads from rusting while sitting on her sink between uses. I've been using S.O.S. for 45 years and my main complaint was that even if the pad still has lots of soap in it, it doesn't last due to rust. Saturday night I took some aluminum foil, folded it in a square just a bit larger than the pad, and put my after dishes S.O.S. and sat it on the foil. As of Tuesday night it is still full of soap and there isn't ONE SPECK OF RUST! I am thrilled that after trying many ways of trying to preserve this incredible cleaning product I've found one that truly works. It will save money trips to the store and the foil is hanging in there too! Thanks so much for sharing this tip Sara! What a great idea. I also found this video where another lady shared her secret for dealing with the rust in these pads too. I will tell you the first couple seconds of the video are kind of shaky, but it's worth it to watch for the idea. Basically, if you didn't watch the video, this lady's tip is to put your pad into a plastic baggy after use (squeeze as much water out of it as possible first), seal it and place it in your freezer. This, she says, will keep the rust at bay too. I'd love to hear even more tips from people who've found a way to keep their metal pot scrubbers and scouring pads rust free. You can share your tips and ideas here, and I'll be sure to add them to the page! Myra has shared how she uses S.O.S. pads in her home, for cleaning. 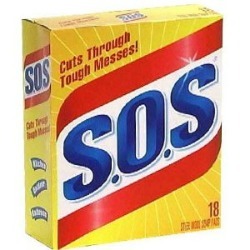 At my age I must have used everything in the world to scrub with, and SOS fills my needs. I like the ones with the lemon scent. You don't even need to use soap, just wet the pad and apply some elbow grease. I use SOS for pots, pans, sinks, stove, faucets, and anything else that needs to be scrubbed. In addition, I use it to remove rust from my chrome bumper of my car. I also use the SOS pads to take the winter dirt off my outdoor patio furniture. If it sounds like they are good for everything, you are right. Now let me tell you the best use I've found for them. You know that sticky kind of coating the glass shower door gets on it, and the soap just kind of glides over it? Well, your worries are over. I uses these pads to scrub and rinse and that's it. My glass shower doors are clean again! The only downside is when you are done with a pad, toss it because it will begin to rust. That is not so bad when you consider how good they really are. Thanks Myra for sharing your many uses of these pads for cleaning. I know that the fact that they begin to rust is a big complaint for many people about these pads. I have done some research into this, and have found that S.O.S. has addressed this issue, at least to a certain degree. Since the pads seem to begin to rust before all the soap is used up out of them, what they've done is also create some SOS pads they call "Clean 'N Toss" pads which are smaller. Therefore, all the soap runs out of them faster, and you can go ahead and toss them, hopefully before they begin to rust on you. I've not actually used those smaller pads myself, so I would love to hear from other people sharing how they work for them, and if this helps solve the rusting problem. You can share your pot scrubbers review here. Meg has also shared how she uses S.O.S. pads in her home. I like these steel wool soap pads. They are an easy size to hold, and the built in soap foams up and does a good job on grease. I have tried the lemon scent, but it doesn't smell particularly lemony to me. The regular scent is fine. I use them around the house for many small tasks. They are good for clearing scorch marks off pans and for getting baked on spills off the stove top. In addition, I save and reuse jars, and I use the cleaning pads to clean the glue off the jars after the label has been removed. One thing I don't like about them though, is that I wish they would not rust so quickly. I seldom use them up completely, they are still in good shape and have soap left, but if I set them aside to use again they get rusty very quickly. Maybe they could come in a smaller size to avoid waste? Thanks Meg for sharing all these uses for these pads. Lots of people have also mentioned that they use them for cleaning their stovetop. What do others use for this purpose? You can share your cooktop cleaner review here, or read other reviews already submitted. Michelle has shared her tips for using these pads in your kitchen, so that you don't harm any surfaces. Personally I prefer to use SOS pads to do all my scrubbing on pots and pans in my kitchen. 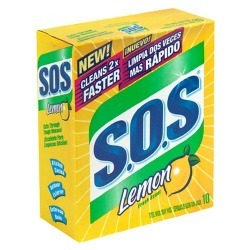 I also prefer that the SOS pads be the lemon scented kind. The steel wool cleans stained, charred, discolored pans back to a gleaning shine with just a little elbow grease involved. I wet the pad to where the blue soapy stuff is coming out and then scour the pots and pans until they shine again like brand new. I have tried several different products in the same category but I continue to stick to SOS because it really outshines the rest. You rub, pressing firmly against the metal of the pan, pot, muffin pan, pizza pan, burner cover, etc., and pretty soon it looks like new again. There are a couple of things I found unsatisfactory when dealing with these pads, though. For instance, I do not like the way the slimy blue soap gets all over your hands making them feel gross. Also, once I left my used SOS pad on the edge of a stainless steel sink and it began to rust it almost immediately. In addition, I've found that you should never, ever use an SOS pad on a non-stick surface because it will strip the the non-stick properties of the pot and your dinners will start burning once this layer is gone. Thanks Michelle for these tips for how you use your SOS pads in your home. You are definitely right about not using this, or any other type of very abrasive pot scrubber on non-stick surfaces. They are just not tough enough to deal with it, and it will ruin them. I know that S.O.S. actually has another product which is designed to clean these non-stick pots and pans, called a Tuffy pad. It is a nylon mesh pot scrubber. If you've used this type of scrubber, I would love to hear from you to share how it has worked for you, and what uses you have for it too, for cleaning your home. You can share your scouring pads and pot scrubbers reviews here, or read other reviews which have already been submitted. Further, I'd love to hear your tips for cleaning pots and pans here, or read others already shared by other readers. Blue soap from SOS pad splashed onto my clothing when using it to scrub a pot. I can't get the blue stain out, sweater ruined. I will not use these expensive pads to ruin my clothes. A paste of baking soda and water works better, is better for the environment, and DOESN'T STAIN CLOTHES! I was doing pot with the blue soap SOS pad and it splash on my shirt. I washed it twice and I still have 3-4 spots the shirt says do not use bleach can you help? I love sos pads but I don’t like the feel of them on my hands when cleaning. I often don’t want to take the extra step of putting on gloves if I want to quickly wash a pot. I would love if they could be attached to a handle. Has anyone found this solution out there? I would love to hear about it.